The next Pecha Kucha Boston event hosts around a dozen diverse speakers from design communities across Boston. 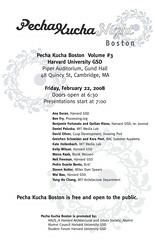 Pecha Kucha Boston 3 is Friday, February 22, 2008 at Gund Hall, 48 Quincy Street, Cambridge, MA. The event is free and open to the public. Presentations start at 7pm. Doors open at 630pm.